Have you ever had a toothache that just pounds? Almost everyone has had a toothache once. There are many reasons why you can get a toothache, so there are many treatments to eradicate that horrible toothache. Root canals, which are rather routine procedures we perform in our Monkton dentist office, can treat toothaches. Why? Because the root pulp that was necessary to your teeth as a child — it helped teeth grow — is no longer needed with adult teeth and root canals may be the prescribed course. 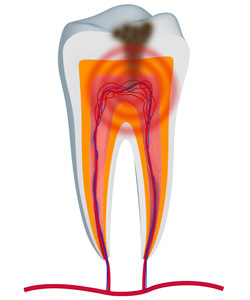 Unfortunately, this root pulp can sometimes get infected, so a root canal is needed to prevent or alleviate a toothache. There are several other reasons why you may need a root canal besides having a toothache. It could be that the tooth already has deep decay. Root canals can treat teeth that have large dental fillings. If you have had trauma to a tooth, if you have a chipped tooth, or even have a tooth that has had multiple procedures, root canal treatment may be what Dr. Longenecker recommends. Our high tech facility is close to Parkton and our caring staff we help you remain worry-free. There are several advantages to having a root canal. A root canal effectively treats a toothache. After root canals are performed, the dentist inserts antibiotics and other medicine into the cavity to keep infection from entering the tooth again. Maintaining good oral hygiene will also help prevent gum disease and other issues. Often, after a root canal, a dental crown is placed on the tooth, strengthening the tooth from further cracks and keeping infection from entering the tooth. Having a dental crown placed after a root canal also has aesthetic benefits in that it looks just like a natural tooth. A dental crown after a root canal also functions just like your natural tooth. Chew and eat as you regularly would. If you are suffering from a toothache or want more information about root canals, call our office in Monkton today! Hereford Dental Care is here to serve the Parkton and Sparks MD areas too!